August Wilson is a master in telling the everyday, slice-of-life stories of the average African-American community and his Pittsburg Cycle, a 10-play cycle of stories (mostly) out of Pittsburg, gives insight to the African-American experience during whole of the 20th century with one play touching on one decade in the century. With the recent popularity and critical acclaim for the film version of Fences, Wilson’s work has been brought to the forefront or, at least, has made a resurgence, which is warranted. Spotlighters Theatre’s latest offering, Two Trains Running, Directed by Fuzz Roark, with Set Design by Alan S. Zemla and Costumes by House of Bankard, touches on the late 1960s experience with authenticity and truthfulness that can only be found in a small neighborhood café with their regular crowd. This production is a great start to an exciting new season. With the intimate space at Spotlighters Theatre, some productions can be more difficult than others and sometimes a big show can feel stuffed into the space however, with the Set Design for this production of Two Trains Running, Alan S. Zemla has outdone himself. He used his space wisely, even with the four troublesome pillars holding the place up! Impressively, he used as much space as needed, but it did not feel cramped in any way. One corner for a counter, one corner for a window table and a jukebox, and one corner for the main entrance and front window while using the main stage for the main dining room worked out perfectly for this piece. It was an open design but not so open that the intimacy was lost. His choice of colors is spot with pinks and blues, which I imagine are remnants of an earlier era of bobbysocks and Elvis Presley that stuck around until the late 60s. Overall, the design is impressive, smart, and simple, working with the space and not against it. Kudos for a job well done. Costumes by House of Bankard never disappoint and it’s the same for this production. Each era definitely has its own style and anytime a piece is hitting the cusp of a decade or era, it can be tricky. The late 1960s were flashy (paving the road for the outlandish 70s), but when you walked through a regular, blue-collar neighborhood, you didn’t see the avant garde fashions that were in the streets of New York City or Paris or Milan, but… just regular every day folks and House of Bankard does an admirable job with the wardrobes for these actors. You could see the differences in these characters by appearance alone and each costume fit each character beautifully from a café waitress, to the stylish proprietor of the café, to an elderly working-man, to the rich under-taker across the street. All costuming is appropriate and feels natural adding great value to the production. Direction by Fuzz Roark is impeccable in this production. Roark really seems to have a great comprehension of this story and the characters and, though there is no major conflict or purpose, most days don’t and Roark guides these apt actors through a day as if we were actually sitting in the café with them, give the entire production an overall authenticity. Roark is experienced working in the round and the action was fluid. It’s a lengthy play, but it doesn’t feel lengthy because of the spot on pacing and, with the intimate space helping, the immersive feeling as if you are sitting at the table right next to these characters. Moving into the performance aspect of this piece, it’s worth noting that every single actor in this small ensemble gives 100% effort and entirely embodies his or her character. Major kudos to the entire ensemble of this production of Two Trains Running. Timothy Eric Andrews takes on the role of West, the very rich owner of the funeral home who seems to want what’s best for the neighborhood, but doesn’t hide the fact that whatever he does can benefit him, as well. Andrews has a very good look for this part and is confident in his role, if not more soft-spoken that I like, at times, but his character mannerisms are a good fit for this character. Taking on the role of mentally challenged Hambone, who is obsessed with getting his ham (which was payment for painting a fence a decade before) from the grocer across the street from the café, is played by Aaron Hancock who does a bang up job with this character. Totally believable and brave, Hancock treats this character delicately and gives a strong, authentic performance that makes you want to take him in his arms and protect him. Taking on the role of the young, kind of mixed up and searching ex-con, Sterling Johnson, is Troy Jennings, who gives an admirable performance. Though his performance is a bit too technical and stiff instead of fluid and natural, he still gives a confident, precise performance, and gives his all for this character. Sterling Johnson isn’t someone you know you can trust… at first, then he grows on you and this is exactly how Jennings played this character and it worked nicely. His chemistry with the rest of the cast is very good and jovial but when it comes to his scenes with Linae Bullock, who plays Risa is, things seem a bit scripted, but still believable and the two work well together. Linae Bullock is a standout in this production as Risa, the lone female character and only employee at the café. Her natural motion and delivery of her dialogue had me believing she was this character from the first time she walked on stage. The character is jaded, but underneath the hard exterior, she has big heart and wants to be loved and Bullock presented this near perfectly. Wolf, the neighborhood “numbers guy,” who is actually a likeable person, regardless of his not-so-legal choice of profession, is played by Mack Leamon who does a brilliant job with the role. He plays the character low-key, as required by one running on the outskirts of the law, and with a heart for the neighborhood and its inhabitants. Leamon doesn’t overplay the light conflict between Wolf and Sterling (whether it be because of Rissa or a change in the rules of the numbers game) making it believable. Next, probably my favorite character and a highlight in this piece is Holloway, the down-home, common sense elderly regular who always has an anecdote or story for every situation, is played Tyrell Martin. The only slight flaw is that Martin may be too young for this role. Appearance-wise, this may have been more successful in a bigger space, but in the intimate surroundings of Spotlighters, it just didn’t read as well as it should have. HOWEVER, that’s not to say Martin’s performance wasn’t spectacular, because it most certainly was! He has a good grasp of this character and his purpose and pulls it off beautifully. Aside from looking too young for the part, he even has the mannerisms and gestures of an elderly gentleman down pat. He fully embodies this role and makes me feel like he’s the good-natured uncle who you visit for a spell, just sitting on the stoop, talking about everything under the sun and watching the world go by. 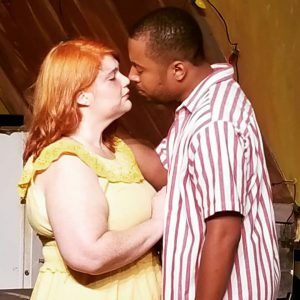 Rounding out the small ensemble and a standout in this piece is Louis B. Murray who tackles the role of Memphis Lee, the proprietor of the small Pittsburg café, in which this piece takes place, known simply as Memphis Lee’s. Murray, who has experience with August Wilson works, is superb as the non-nonsense, old-timer who doesn’t seem to understand the generation of outspoken activists. Murray understands where this character is coming from and gives a confident, natural performance. 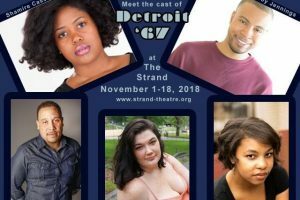 He delivers August Wilson’s words with passion and intensity, when needed, as well as with a tenderness that is seeping just under the surface in this character. He, too, is someone to whom everyone can relate… like an older uncle or family friend who you don’t mind spending an hour or two with each week, just talking and learning. His chemistry with the rest of the ensemble is on point, as well, making for a strong, thoughtful performance. 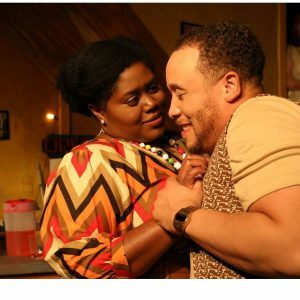 Final thought… Two Trains Running is a poignant, relatable look at the African-American experience in America, told masterfully with a thoughtful script, good directing, and exquisite performances. The chemistry in the cast is strong and every actor has a good comprehension of what their characters are all about and how they fit in the story. As part of a 10-play cycle, this work stands alone and really puts you in the moment. Though there’s no major conflict, this piece works nicely as a “slice of life” piece where the audience is witness to every day goings on in a small café in Pittsburg and, because of the dialogue and situations, it’s still enthralling. This production is a great addition to the theatre season and you should get your tickets now! This is what I thought of Spotlighters Theatre production of Two Trains Running… What did you think? Please feel free to leave a comment! Two Trains Running will play through October 8 at Spotlighters Theatre, 817 St. Paul Street, Baltimore, MD. For tickets, purchase them online.